Pecans are my favorite nuts, hands down! When my oldest daughter’s boyfriend (now husband) lived in NY and was studying for his finals in grad school, she thought it would be a splendid idea to share some love and send him a care package. We (do I have a frog in my pocket?) prepared all kinds of homemade goodies and she FedEx’d them right over. He was beyond excited! He was in awe of the variety of homemade snacks. But, he couldn’t quite wrap his head around the Spicy Southern Pecans. I mean, he is a Yankee, bless his heart! Andrew had never eaten anything that remotely resembled the sweet, yet spicy, taste of those nuts and didn’t know if he liked them or not, but he couldn’t stop scarfing them down. So he, jokingly, renamed them Voodoo Pecans because they were so addictive and he couldn’t stop eating them. Mix together olive oil, ground cumin, cayenne pepper, salt and sugar (or Splenda). Add pecan halves and stir together. Spread in a single layer onto an ungreased baking pan. Bake at 300° for 25-30 minutes or until lightly browned, stirring occasionally. Cool. Store in an airtight container. Yield: 2 cups. Note: I grew up in Georgia, in a subdivision that is located in a huge pecan orchard. One of my most precious Christmas gifts most every year was from my mom and dad; an extra-large Christmas gift bag filled with packs of freshly picked and shelled Georgia pecans, from their yard to my freezer! They are the best pecans in the world. I can’t get pecans like that in the grocery store. No siree! Historically, Georgia is the leading state in pecan production, so I guess that’s why pecans are my favorite nuts. I grew up eating them! I also grew up saying pee-con’ (emphasis on the con’) instead of pee-can. My mom always said that a pee-can was something you pee in. How do you pronounce pecan? Be sure and make these Voodoo Pecans! Yes, the entire family calls these VooDoo Pecans now! They will definitely put a spell on you! You could sell those and be rich! LOL you are lucky your parents have a tree. Nice recipe I bet my husband would love them. The pecans that come from their trees are so much better than the pecans in the grocery store! There is no comparison. When I make these, I have to hide them from myself. I could eat them all! 🙂 Thanks for commenting! I say pe-con but Bobby & inlaws pick on me bc they say pe-can…now to make me some!! I’ve been picked on, too. It’s funny how, even in the south, our pronunciations can be so different. Hope you enjoy the pecans! These sound wonderful! I love to snack on nuts. These look so yummy! And I think the name is awesome! Recipe names are so much more fun when they aren’t just descriptions of the ingredients! The first meal I ever made for my husband in our crappy college apartment was this chicken and pasta casserole dish that we ended up loving. We named it “First Nite Pasta” and it’s still one of our faves more than four years later! Hopped over from the Throwback Thursday party! I love it – First Night Pasta! How romantic You’re right, names are so much more fun when they mean something special. I’m about to head over and check out your holiday home tours. 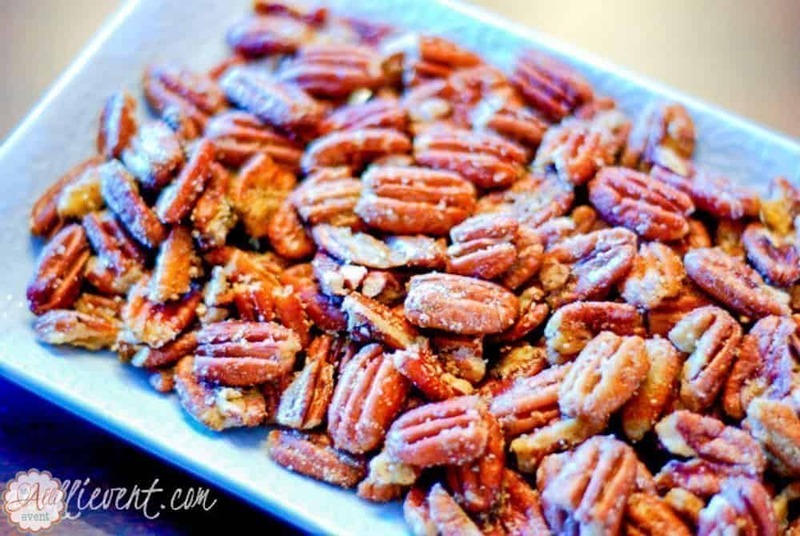 I absolutely love spiced nuts, and this version of spiced pecans sounds amazing! I’d love to try it! Oh, and I generally say pee-can lol! I say pee-con but have a few friends that say it the other way. I think these sound amazingly good! These pecans look absolutely AMAZING. I remember when I was in college I was always so stressed out during finals, and my Dad would always send me a sweet treat to make me feel better. It is one of my favorite memories of him. You guys are awesome for Fedexin’ the then boyfriend a food package. My Mom used to do that to me when I lived…. in the same country as her lol. I miss them! 🙁 I bet I’d love those pecans… ugh, those are like one of my fav nuts (I have many…brazil one’s, cashews too are delicious omg… so are walnuts). I can go on. I’m a California girl and we say pe-can! These look tasty and great to have around for the holidays. Thanks for sharing! The vodoo pecans looks like a really tasty snack. It’s gonna be great to have this while watching a movie. I pronounce them pe-cans. I love the taste of salty and sweet!!! I’m not a huge fan of pecans, but these look delicious. I’ll be trying these soon! I’ve had something similar and they were tasty. These look and sound tasty too. I love the name of these pecans! I’ve made candied pecans before, but I bet my husband and son would love this. I do a sweet Pe – con, but this would be great for those who like a little spice, which I don’t. Maybe I will add this and make a combo pack for gifts. Thanks for sharing. Love this! I’m always trying to find new things that I can pack as snacks and this would be perfect. It also looks like it would be yummy in oatmeal, too!